© All images and posts copyright to Hannah at justmycouture 2016. Powered by Blogger. Today I am bringing you a review of Glossy Box - a monthly beauty subscription service that costs £10 per month plus £3.25 P&P. The money is automatically taken from your account in exchange for a beautifully wrapped box full of goodies to be delivered during the first week of every month. 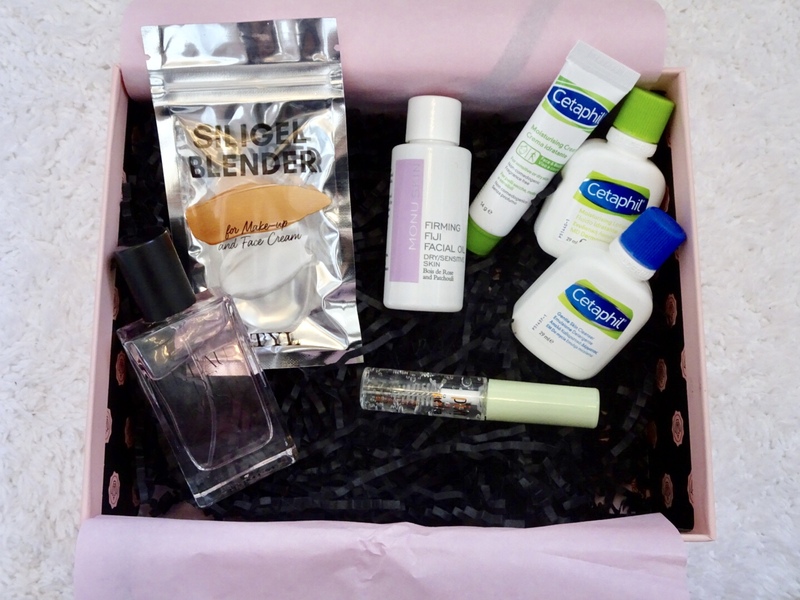 I have been subscribed to a number of different beauty boxes for about 5 months or so now and I have to say that Glossy Box is by far my favourite subscription box. The price is great and I am rarely disappointed when it appears at my door every month. 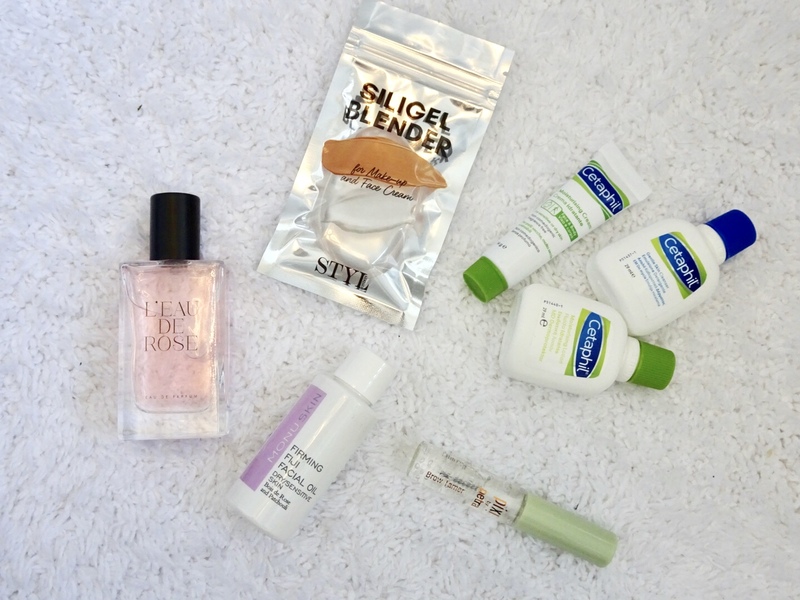 September isn't my favourite box I've received but there is a few products that are worth mentioning. Do you remember when silicon blenders were all the rage and everyone and their dogs had one? I have to admit I have tried silicon blenders in the past and I have to say I wasn't a fan before and I am not a fan now. For me, I like it when my makeup sinks into my skin and blends nicely with my natural skin however, I find with silicon blenders the makeup just sits on top of my skin and leaves a false, thick layer of streaky make-up. I have watched numerous videos on different ways to apply make-up with them but it's safe to say I will be sticking to the traditional sponge beauty blender. I was on the hunt for a clear brow gel and to be honest there's not much to say about a clear gel. It does it's job, it's not too sticky but still manages to keep my stray brow hairs in place for the whole day. The price point is in the mid range between drugstore and high end and if I'm honest, it's a good brow gel but I'm not sure whether I would justify £12 on repurchasing. The mini trio I received consisted of a facial cleanser, body moisturiser and facial moisturiser. In my opinion there isn't much to say about moisturisers accept it was nourishing and my skin did benefit from the hydration qualities in the cream. I would say the facial cream was very kind to the skin, I am always dubious of trying new facial products but I have to say I was pleasantly surprised that I was able to enjoy all of the benefits without any itching or soreness. I am in LOVE with the perfume. Omg, it's incredible. So not only is it a full size product it smells absolutely gorgeous. During this month it has been my daily go to. It claims to be an elegant yet sensual fragrance with a modern reinvention of rose. If you ever get the chance to smell this in store then definitely do so. It's such a light fragrance and for £20 you can't go wrong. Facial oil is a completely new concept to me but I can now confirm that it is now a staple in my nightly routine. It's said that you can use the oil both day and night however, I am up early mornings and I never make time to a dedicated morning routine but after a long day at work there is nothing nicer than massaging a few drop of this oil into your skin. I wake up in the morning feeling refreshed and hydrated. If you're in the market for a new oil to brighten and firm your skin then definitely give this one a go. Overall, a good month and variety of products. I'm so excited for my October box and I still can't believe that autumn is upon us. Do let me know what your favourite subscription boxes are as I'm always on the look out for the best beauty boxes. During the much awaited bank holiday weekend (which has now sadly been and gone since you are reading this and yes, I know this is extremely overdue) my boyfriend and I decided to visita place in England called Devon AKA The English Riviera. I have been to a lot of coastal towns during my short amount of years on earth, mainly the typical ones such as Brighton, Hastings and the oh so lovely Southend-On-Sea. We left Surrey at 6:30am (waaaaaaay to early for me and most probably any other human at the weekend) and headed straight to Mcdonalds for a super nutritious breakfast and a pick me up coffee. After driving for what felt like forever we hit traffic and let me say I was not pleased at all until I realised that we were driving past Stone Henge which in real life is quite a treat to see. I have to admit I do not know an awful lot about the famous sight but the fact that I could now tick this off my bucket list of British sightseeing locations was a bonus. We drove for another couple of hours before finally making it to Brixham, Devon. Seeing as it was both our first time visiting this coastal destination we were super excited to see what Devon had to offer. Let me just say we were by no means disappointed. Not only were there dozens of independent shops and restaurants there was also your traditional British high street consisting of Boots, Superdrug and Tesco - just to name a few. We stayed at a family members house which was only a 10 minute walk into the main harbour area, Oh, and can I just say how lucky we got with the weather?! Not a cloud in the sky. On our second day we visited Torquay via a ferry boat and as you will see from the photos below we stopped off at a place called Living Coast (a coastal zoo or am I just stating the obvious). It was lovely to see marine animals in a place where they are truly being looked after. I have to say I am not a fan of zoos or animal captivity in general but from what I saw and read about the Coastal site was home to many abandoned and rescued animals. On our last full day which Sunday and we spent the day lazily wandering through the cobbled streets and picking up some obligatory coconut ice and vanilla nougat. We eventually stopped for a glass of wine (or should I say beer for my boyfriend) at a lovely bar/restaurant called the Old Market House which has gorgeous views across the harbour and trust me, you could sit and people watch for hours. I would love to revisit Devon and do a little more exploring sometime in the near future as there are definitely places that my boyfriend and I didn't quite get time to visit. I've heard amazing things about the beaches and country parks so they will 100% be on my list for next time. Omg! How could I forget?! I didn't even manage to try the ever so famous scones. I guess it looks like I have a certain reason to return now. What did you all get up to during the bank holiday weekend? Over the past month or so it's been nothing but cold, gloomy and rainy here in England and it has definitely taken a toll on my skin. I suffer from dry skin already and not only with that in mind I am making my big move to Austria (at the moment the weather is -2 degrees, help) on Friday so it was time to step up my skin care routine and grab a few winter essentials. After being snuggled in bed with a cup of hot chocolate I decided to have a little browse online at some blogs and reviews of skin care products. I always tend to spend hours searching and adding things to my basket but never end up taking the plunge... So, that being said I managed to bag a couple of samples from my local store and here's what I picked up! My favourite has to be the gentle foaming lotion. I have never tried anything like this before and it literally leaves your skin feeling baby soft. It's not the type of softness that lasts for a few hours and then goes, it leaves your skin pampered for days. I tend to use it in the morning in replace of my usual face wash and then follow by using my moisturiser. It's so luxurious and I will definitely be investing and getting the full size version which costs around £20. If you have a local Clarins near you then you should definitely pop in and grab a few samples to try out. All of the ladies that served me were so helpful and are more than happy to help. What's your winter skincare recommendations? It's me I'm back again. 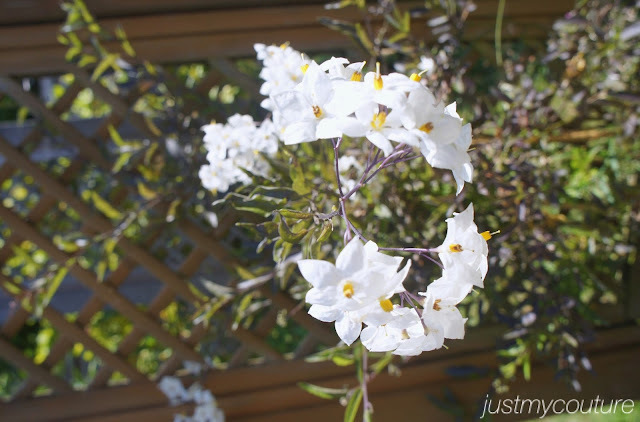 So, I have been MIA recently in the world of blogging. A lot has happened over the past few months but, I am now in a position where I can dedicate some spare time to writing down my thoughts, rants and reviews. I start a new job next week which entails moving to a completely different country and yes, it's going to be a struggle but I will have a lot of free time to chill out and do what I enjoy... which is you guessed it, blogging. Okay, so to ease me back in I have decided to pick out my must have beauty picks and some of them may well be dark horses but, hopefully you will like what you see. Highlight. A must have beauty essential (in my opinion). Okay so you have 5 minutes to get ready and leave the house? Blend a bit of foundation, sweep some light powder over your brows and then highlight like crazy. Simple but effective. My absolute go to highlight at the moment is Kiko's long lasting wet and dry eyeshadow in shade 208 (yes, I said eyeshadow). Who says you can't wear eyeshadow on your cheeks? Push the boundaries. The moment I saw this shadow in the shop I knew it was going to become one of my staples. It's a gorgeous deep gold colour with flecks of iridescent glitter. Perfect for late night strolls in the park or even a quick trip to Tesco to grab a pint of milk. Not only does it make a great highlight but it also makes the perfect gold smokey eye look for the holiday season. Honestly, if you haven't given this a go then please go out and try it. It retails at £8.90 and trust me, a little goes a long way. If you'd like to take a look then just click here. Let me know what your go to highlights are? I'm always looking to expand my collection. A 21 year old girl from Essex. Inspired by beauty, travel, people and music. Expressing myself through fashion, makeup and daily lifestyle.